When I was listening to a local FM radio station, I heard that the DJ was interviewing a priest. They were talking about the visit of the Relic of Don Bosco here in Negros Island and the rest of the Philippines. Since I am not a Catholic, I have never heard about what they were talking about but their radio talk sparked an interest in me, I decided and searched about it. 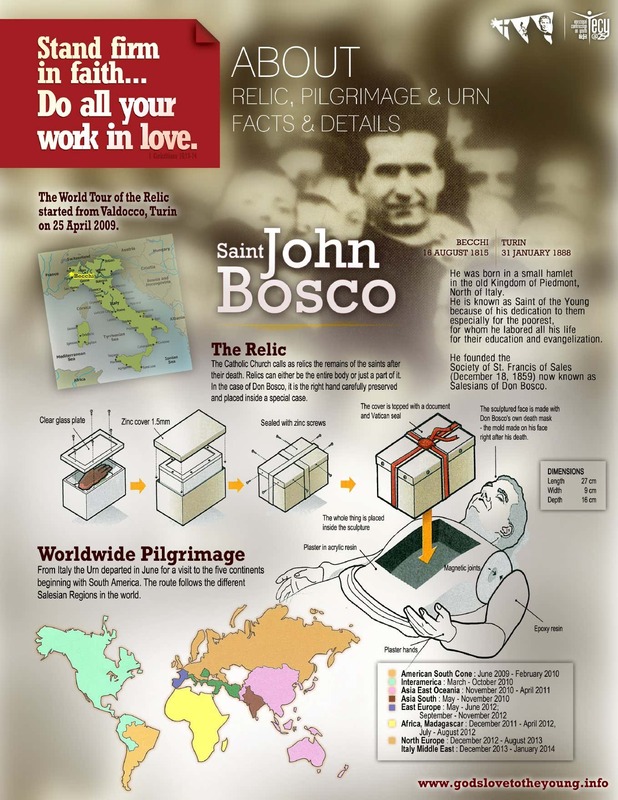 After several searches, I came to know more about St. John Don Bosco. His history and works were awesomely outstanding. He was known as the Priest of the Young. He was more concerned about saving souls rather than accumulating wealth. He was more known of his unselfish works for saving the youth for God’s kingdom that is why he is the patron of the young. The Relic on the other hand is the remains of St John Don Bosco placed in a very large urn. Since his remains were exhumed in 1929 for beatification and canonization, his bones and tissues of the right hand and arm were placed inside a wax replica of his body as its final resting place. Now, this large urn or known as The Relic of St. John Don Bosco has been traveling to 130 nations since January 31, 2009 to reminisce the 150th Anniversary of the founding of the Salesian Congregations. It is also an event that prepares advocates and devotees for the 200th Anniversary of Don Bosco’s birth. According to calendar of pilgrimage, The Relic was at Bacolod Cathedral just this morning! Since I was asleep, I missed it so badly! Now, it is travelling going to St. John Bosco Parish at Mambucal for its viewing this afternoon around 5:30-6:30pm and then will travel on the next day to stay at Don Bosco Technical Institute in Victorias, Negros Occidental. 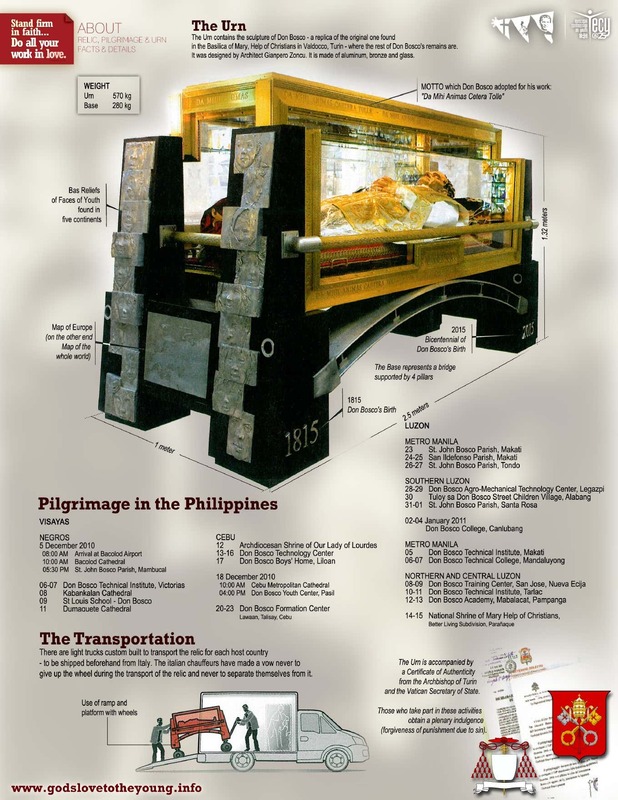 Anyway, for those who want to catch The Relics travels in the island of Negros and the rest of the Philippines, please refer to The Relic’s Calendar of Pilgrimage for more details. 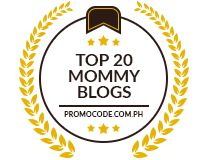 hi mommy rubz, thanks for posting this very informative piece about St John Bosco. Hi Maam Rubz, thanks for posting the facts about the relic and the pilgrimage and thank you also for appreciating his work.